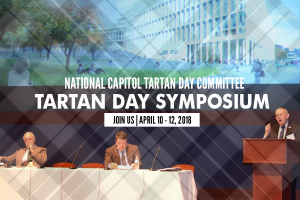 History of Tartan Day | Official site of Tartan Day | Washington D.C.
Americans of Scottish descent have played a vibrant and influential role in the development of this country. However not until 1997 was this influence recognized by a single-year U.S. Senate Resolution that appeared in the Congressional Record of April 7, 1997. In 1998 National Tartan Day was officially recognized on a permanent basis when the U.S. Senate passed Senate Resolution 155 recognizing April 6th as National Tartan Day. This was followed by companion bill House Resolution 41 which was passed by the U.S. House of Representatives on March 9, 2005. The passage of this bill was due to the work of the National Capital Tartan Committee, Inc., and president James Morrison. That date commemorates the signing of the Declaration of Arbroath in 1320, which asserted Scotland’s sovereignty over English territorial claims, and which was an influence on the American Declaration of Independence. Canada has been celebrating “National Tartan Day” since 1993. The idea and motivation for creating a similar American holiday was provided by the Scottish Coalition, a group of national Scottish- American cultural organizations. See also the Presentation of Senate Resolution to the College of William & Mary. The following account of the creation of National Tartan appeared in the Winter 1999 issue of Caledonia News, a publication of the Caledonia Foundation, and is reprinted by permission. Tartan Day – April 6, 1997: A Great Success! The first Tartan Day in the United States was observed at the national level on April 6, 1997. Previously, there had been observances by individual states, counties and other regional entities, but the year 1997 was the first time the observance swept across the nation. Since then, the question has been asked many times: “How did this get started?” It seems desirable, since undoubtedly the question wilt continue to be asked, to give the background of this historic event. In 1995, The Caledonian Foundation invited the Scottish-American organizations operating at the national level to meet in Sarasota, Florida, for the purpose of exploring ways in which all might cooperate and advance their programs. When the conference was held March 8-10, 1996, Duncan MacDonald, a trustee and executive vice president of The Foundation, having learned of the observance of Tartan Day in Canada, placed this item on the agenda for discussion. Neil Fraser, Secretary-Treasurer of the Clans and Scottish Societies of Canada (CASSOC), was asked by Col. John H. Napier, III, moderator of the meeting, to give an overview of this special event which has been observed in Canada since 1993. Following Neil’s remarks, the project received unanimous approval as one to be further explored. When a second national meeting was convened February 7-9, 1997, there was further discussion and plans were made for the observance in the current year. Tt was agreed by the six national organizations – American-Scottish Foundation, Association of Scottish Games & Festivals, The Caledonian Foundation, the Council of Scottish Clans and Associations, Scottish Heritage USA, and the Tartan Educational and Cultural Association that this observance did provide an excellent venue to give visibility to Scottish heritage. Following the conference, ads were placed in “The Highlander” in “Scottish Life” and in “Family Tree,” producing an enthusiastic response from across the country. JoAnne Phipps, a member of Clans of Scotland, Inc. and also a Caledonian Foundation member, working with the staff of Senate Majority’ loader Trent Lott, took the lead in preparing materials and background information for the Senate Resolution that appeared in the Congressional Record of April 7, 1997. We would like to note parenthetically that the Senator’s staff was provided with Duncan Bruce’s book, ‘”The Mark of the Scots,” which has important background information that was then included in the Resolution. Around the country, a true grass-roots effort took place. Thousands of Scots-Americans found ways lo observe the first Tartan Day in churches, on village greens, at Scottish festivals, at social gatherings, and in the home. It would seem that at last the Scots in America had found a cause around which all could rally. Tartan Day was observed on April 6, 1997, for the first time in U.S. history. And it is a day that will be observed so long as there are Scots who care about their heritage. Special thanks to Ms. Duncan MacDonald of the Caledonian Foundation for providing this information. The following is excerpted from an article that appeared in the Winter 1999 issue of Caledonia News, a publication of the Caledonia Foundation, and is reprinted by permission. When the United States Senate, under the leadership of the Hon. Trent Lott passed Senate Resolution No. 155 establishing Tartan Day as a rational day of observance, the question immediately came to mind regarding an appropriate place for the document itself. As will be noted in the remarks that Follow, The College of William & Mary in Williamsburg, Virginia, proved to be the ideal location. The presentation ceremony was held September 25th, 1999, in the Botetourt Gallery of the Swem Library. Representatives of the national organizations in the Scottish Coalition were present as well as numerous volunteers from around the country who had played a major role in the success of the Tartan Day celebrations. “Swem Library and The College of William & Mary are indeed pleased today to welcome members of The Scottish Coalition. “We are honored to be asked to house the official copy of the U. S. Senate proclamation of April 6 as Tartan Day. William & Mary seems to be an appropriate place, given the strong Scottish role in the founding of America and in the development of American education and the equally strong role in the founding of William & Mary. “James Blair was the Scottish-born and Scottish-educated cleric who founded The College of William & Mary… Fortunately for us, James Blair, also an alumnus of Marischal College in Aberdeen, was successful in his quest to build a university in the colony of Virginia and in 1693 he obtained the charter from King William and Queen Mary. “The establishment of April 6th Tartan Day as a day of observance has been a very special experience for Scots-Americans. Other groups have celebrated their culture and their heritage, and although we have St. Andrew’s Day and Robert Burns observances, we have not really had a single event on which to focus. “Two years ago, the national organizations in the Scottish community came together to establish Tartan Day as a national day of observance. As a result, hundreds of thousands of Americans of Scottish descent have reconfirmed their heritage. There was no committee on the East Coast or the West Coast, North or South, to tell anyone what to do. Different individuals around the country simply came forward and had marvelous celebrations. Our ceremony today is to honor those dedicated volunteers who led the way in making more visible the contributions made by Scots to the United States and, indeed, to the world. He said, “Robert Burns and his writings are considered to be a beacon for untold thousands of common persons with whom he lived, talked and wrote about, and from whom he received so much inspiration, as is shown in his writings. Tartan Day should also be considered a beacon for all of us of Scottish heritage to continue the Scottish traditions and not let them die. “As a nation we really do owe a tremendous debt to those early Scots who helped settle this country. Scots knew how to fight. They still do. Scots were willing to die on behalf of their freedom, and they had little love for the British. “I think sometimes the contributions that Scots have made to the establishment of this nation draw little attention. Many of you know Duncan Bruce, and if you have not read his book, ‘The Mark of the Scots,’ I would hope you would find a copy and read it. He does an excellent job in laying out the Scottish contributions to America. “Tartan Day is a way to start re-educating Americans on the contributions that our forefathers have made. It is fitting that we leave this document here at William & Mary where in so many ways we are close to the beginnings of our nation. So, on behalf of all the St. Andrew societies in America, we thank the College and all the members of the Scottish Coalition for their work in making Tartan Day a success. “This quotation, dear to the hearts of all Scots, is from the Scottish Declaration of Independence, signed in 1320 at Arbroath Abbey. “The contributions of Scots and Scots-Americans are woven throughout the history and culture of this country. Tartan Day has been established to observe our rich heritage. Our sincere thanks to the United States Senate for giving us an official national Tartan Day. Margaret Kennedy of New York City, a board member of The American-Scottish Foundation, commented on the founding of the organization by Lord Malcolm Douglas-Hamilton in 1956 and its present-day role of advancing contemporary Scottish interests in both the United States and Scotland. She gave as examples of the work of ASF the raising of $15,000 to acquire two double-width looms for the Harris Tweed weavers. She explained that to compete in today’s fabric market, weavers must use the 54-inch width looms but, at a cost of many thousands of dollars each, weavers could not buy them without financial aid. The Foundation also raised money to help the funding of the John Muir Trail in Van Cortlandt Park in the Bronx, New York. The project was carried out with other organizations and coordinated by New York City’s Park Commissioner. A top priority is the establishment of Scotland House as a commercial and cultural center for Scottish affairs, based in New York City. A campaign of $8 million has been launched for funding. In introducing JoAnne Phipps of Alexandra, Virginia. Miss MacDonald emphasized the fact that Mrs. Phipps had been a key person as liaison with Senate Majority Leader Trent Lott, noting that both were Mississippians. “I regret that I cannot be with you for the completion of a journey that began in November 1996, with the initial request for a Tartan Day resolution. 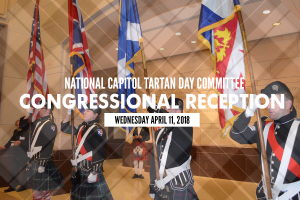 I was delighted to assist you and the groups in insuring that April 6th of each year would be officially recognized as Tartan Day. a day to be celebrated nationwide in honor of the millions of Scottish-Americans and their contributions to our great country. “The designation of Tartan Day recognized the invaluable role that Scottish-Americans have played in American history. It is certainly significant that one half of the signers of the U. S. Declaration of Independence and three-fourths of all U.S. presidents have been of Scottish ancestry. It was an honor to have been involved in this very important effort and again, congratulations in finding such a noteworthy home for the Resolution at The College of William & Mary even if it isn’t 0l’ Miss. JoAnne Phipps then presented Senate Resolution No. 155, signed by the Secretary of the Senate Gary Sisco, to Col. Robert McWilliam, representing The Scottish Coalition. Col. Robert McWilliam of Milwaukee, Wisconsin, was asked to comment on the work of the Council of Scottish Clans and Associations, of which he is president: and also on Scottish Heritage USA, of which he is a Counsellor. He said that COSCA was founded in 1974 by the late Dr. Herbert P. MacNeal with the thought of providing a central organization that would help individual Scots find their clan and lo assist others in forming clan societies. “In the U.S. at the present time we have about 170 clan societies, and they range from 7,000 individual members, such as in Clan Donald and Clan Campbell, down to just a couple of hundred, but they are all very active. “In the last few years, as a result of meetings, publicity, and setting up information tents at Scottish Games, there has been a large groundswell of interest. However, the Highlanders represent only about 30% of the Scots. That doesn’t deter the others one bit because we now have the District Associations, and they are acquiring their own district tartans. So, in conclusion, we try to help the clan societies, and we try to help those who would like lo start a clan society. But we always need volunteers. However, getting Scots to go in one direction is like herding a bunch of cats. (Laughter). But Since you get used to that, you are all right and the frustration goes away. Mention was also made of the work being done by the Tartan Educational and Cultural Association, which is also a member of The Scottish Coalition. TECA Maintains computer-documented files on many hundreds of tartans and handles thousands of inquiries each year at no charge, either through the mail or at information booths at many of the Scottish gatherings. McWilliam said, “In that chapter, Bruce states, and produces plenty of credible evidence, that the declaration of Arbroath of 1320 and the Scottish National Covenant of 1638 were models in which the language and concepts were extensively used in the drafting of the Declaration of Independence and the Preamble to the United States Constitution. “I have always believed that the Declaration of Independence was a document divinely inspired with spontaneous creativity, written by men of great genius. Duncan Bruce boldly asserts that it was the Scottish professors and tutors, the products of The Scottish Enlightenment, who taught men like Jefferson and others who were on the drafting committee that produced these documents. Jefferson was a descendant of Thomas Randolph, one of the signers of The Declaration of Arbroath. “As we have heard, Jefferson was also greatly influenced by several Scottish tutors, but most importantly by Professor William Small. But the author then goes on to list the Scottish-Americans of that time who were taught by these professors and tutors in an effort to show that Scottish philosophy was the American political thought.